This is my second installment of the Truth Campaign. This is a campaign geared towards clarifying common misconceptions about acne and skin care. I have often heard about the saying "You are what you eat." For years, I refused to believe in such. I would often defend my eating habits with my skin type. I felt that having dry skin is an excuse for me to develop acne. As years went by, I proved myself wrong. When I went to law school, my eating habit worsened. I would often skip vegetables and fruits. I fed my brain and tummy with comfort foods (pizza, fried chicken, milk tea, chocolates, junk food etc.) My perception on having dry skin changed especially on days when I was stressed with school. There were a lot of instances where my chin and forehead was bombarded with acne. Also, have you experience having a zit inside your nose? I did!! It took a lot of time for me to realize that my diet and stress were the primordial reasons for my break out. This is based on my personal experience. Also, this is merely based on my personal assessment on my skin. I researched about the relation of food and acne. Honestly, instead of discovering the truth, I was a bit confused. There are contrasting studies about food and acne. 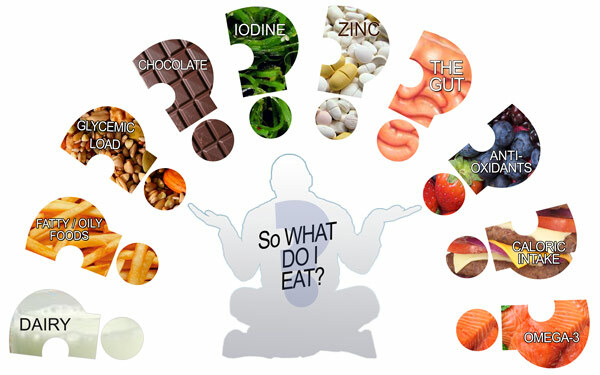 The truth is - The food we eat affects our over all state of health. Clearly, our skin is not excused. The food we eat may not necessarily cause acne per se but it can trigger and aggravate acne. The food we eat affect our hormones, in effect, it can contribute to our oil production and can even affect acne inflammation. Studies can not easily debunk the link between food and its effect on our skin because what we eat is not the only factor that we have to take into consideration. Limiting our intake of fatty foods and dairy can never clear our skin if we do not take care of it. Achieving clear skin is not a one night wonder. There are various factors that need to be considered. These factors are - lifestyle, hygiene, environment, and a lot more. In my case, stress and food are on top of my list. How do I deal with acne? I honestly do not apply topical medicine to lessen the inflammation. My only cure? I really watch out what I eat. Although there is no definitive study pointing food intake with acne, I still watched my diet. I believe that prevention is better than cure. Thus, instead devouring the Milka (chocolate) inside our refrigerator, I would eat my favorite fruits -banana, apple and pears just to satisfy my sweet tooth. I also try my best to incorporate vegetables in my meal. I have to admit that I am not fond of healthy foods but BF (the health conscious one) would always encourage me to stay away from meat and fatty foods. The last time I have an acne breakout was just a month ago and watching what enters my tummy helped a lot. Also, I drink loads of water. Water has been and will always be my so called beauty elixir. It does not only flush out the toxins in the body but it hydrates my skin making it healthier. Indeed,a balanced diet and a healthier lifestyle may help a lot in having healthier skin, but acne- free skin requires more than just watching our food intake. I once asked my derma if there's any food I should avoid so I would not get acne, like peanuts or chocolates, and she said I could go right ahead and eat anything. I should have asked what food should I eat so I would have better skin. Your boyfriend being a healthy eater is a lot of help, probably. It's always easier when there's someone to police you. :)) I don't have problem skin but I do see the difference when I opt for a healthier (well, as healthy as I can manage, comparatively) diet. My skin is a lot smoother and softer. I'm pretty basic--moisturize, SPF, lots of water and vitamin E. I'll try to tackle veggies soon haha. I agree, food can have a big impact on pretty much our whole body. The food we eat can also affect our hair. It can take awhile to get out of the habit of eating junk food, but it's completely worth it! Great post!